I have always enjoyed being a backyard detective. Whenever I take a walk around my property I am constantly looking for wildlife, or telltale signs that tell me that they have visited my yard. On many occasions, I would never know that a particular animal had ventured into my yard if I was not able to read the signs it left behind. On a recent early morning walk, I stumbled across a green loblolly pine cone that was missing some of its scales, the core of a pine cone, as well as a number of green pine cone scales. Since I have found similar items in my yard over the years, I immediately knew the identify of the animal left these clues behind. In this case, these items told me that a gray squirrel had ben feasting on loblolly pine seeds high above in the canopy of a tall loblolly growing in my backyard. It seems that gray squirrels like to dine on the unripe seeds found at the base of the tree’s green pine cones. In order to reach these delicacies, the squirrels have to dismantle a green pine cone one scale at a time to reach the seeds. When a squirrel finishes with cone, it simply drops the core to the ground. I suspect that the pine cone that was missing only a few scales was accidentally dropped by a hungry squirrel. Over the years I have encouraged my daughter and granddaughter to join the ranks of backyard sleuths that are always looking for clues that are hiding in plain sight. To this day, they routinely call me up to share their backyard discoveries. When they do, I like to believe that I played at least a small roll in enhancing their appreciation of the natural world that exists just beyond their backdoor. Amazingly the brown thrasher is known to sing more than 1,100 song types. The phrases of these songs are characteristically repeated in pairs. The Augusta Council of Garden Clubs, in association with the National Garden Clubs, The Garden Club of Georgia and the Azalea District of the Garden Club of Georgia is presenting Course I of the Gardening Study School. The school will be held at Phinizy Swamp Nature Park September 23-24, 2016. This intensive course will focus on a number of topics relating to the world in which we live including environmental issues, networking and outreach, plant biodiversity, backyard wildlife habitat, historical actions and leaders, ecology, environmental science and sustainability. I will be will be teaching the session on backyard wildlife habitats. My talk will deal with all facets relating to creating and maintaining diverse populations of birds, wild pollinators and plants in backyard settings. Although the study school is designed for members of the Garden Club of Georgia wanting to attain recognition as an Accredited Environmental Consultant, the courses are open to the general public. http://augustacouncilgc.com/index.html For more information as to how you can attend the section dealing with backyard wildlife habitats, or the entire course, contact: Judith Kirkland at jukirkland@knology.net. Backyard Secrets–WHITE EASTERN BLUEBIRD EGGS? Anybody that maintains and regularly checks eastern bluebird nest boxes in their yard can tell you that bluebird eggs are normally blue. 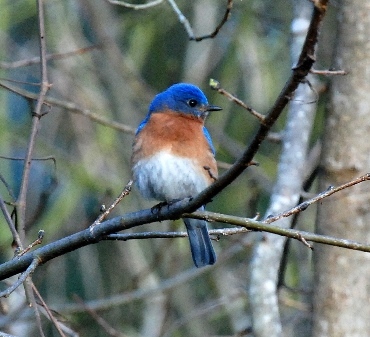 However, from time to time, bluebirds do lay white eggs. In fact, biologists estimate that approximately 5 percent of all bluebird eggs are white. Typically, if a female eastern bluebird lays white eggs, all of her eggs will be white. However, on rare occasions, bluebird clutches will contain a combination of white and blue eggs. It is believed that the appearance of a white egg in a nest of blue eggs, or a blue egg showing up in a nest of white eggs occurs when a second female deposits an egg in a another female’s nest. This behavior is called dump nesting. I have never seen a white bluebird egg. Have you? If you are looking for an attractive plant to add to your backyard garden, butter-and-eggs (Linaria vulgaris) is probably one you need to keep off your shopping list. Butter-and-eggs has a number of interesting common names including toadflax, dragon bushes, calf’s snout and devil’s flax. I suspect that that the plant has so many names because is it ranges of such a large area. Butter-and-eggs is native to much of Asia and Europe. In addition, it has been naturalized throughout both Canada and the United States. I first became familiar with the plant when my wife pointed out a stunning wildflower she had found in a section of our yard that had recently been rescued from an invasion of wisteria, Japanese honeysuckle and greenbrier. The plant was truly stunning. My wife thought that it was a snapdragon as its blooms looked very much like those that festoon cultivated snapdragons. As you can see from the accompanying picture. the blossoms are pale yellows and feature darker yellow or orange centers. Each bloom also displays a prominent spur. 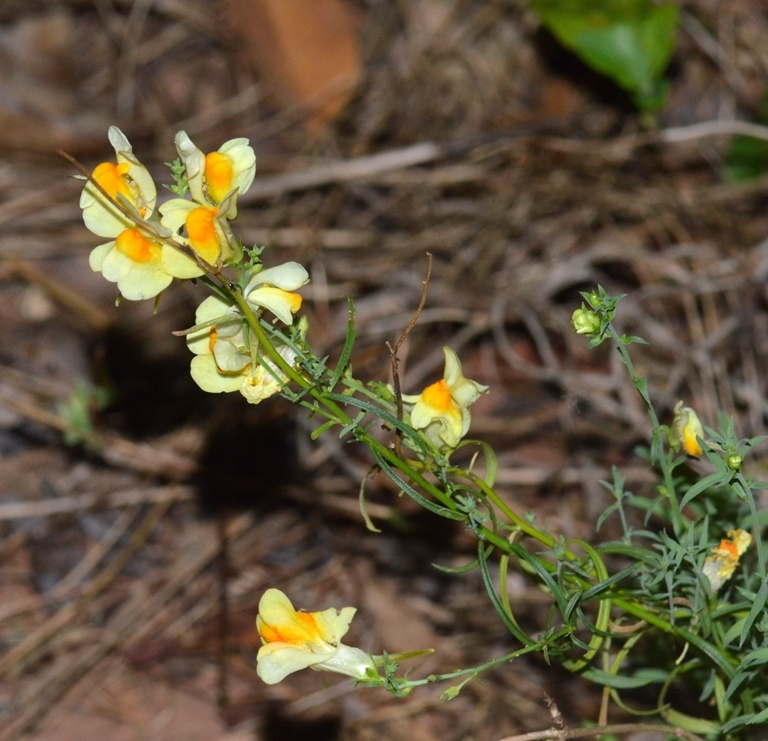 While our plant was short, typically toadflax displays its blooms on stalks that can reach three feet in height. The plant is primarily a summer bloomer. After checking a couple of our wildflower books we learned that it was indeed a member of the snapdragon family. At first it seemed that toadflax was a plant that we wanted to nurture. However, further reading revealed that this beautiful plant is also highly invasive. It seems that it spreads both by seeds and underground runners. As such, it can quickly crowd out native plants. This is a shame as butter-and-eggs is both beautiful and a source of food for bumblebees, moths and other insects. Since there are so many other less invasive plants that are a source of food for native pollinators and are attractive too, I know that we will be looking elsewhere for a new plant to add to our home landscape. A female mourning dove can reproduce when it is only 90-100 days old. As such, a female hatched early in the year can actually lay her own clutch of eggs later in the same year it fledged. The snowberry clearwing moth has an identify problem. This should come as no surprise since this small (1 1/2-2-inch) moth doesn’t act like most moths. It prefers to fly about our yards visiting the flowers in our gardens when most moths are resting awaiting the arrival of night. The fact that it darts from flower much like a much larger ruby-throated hummingbird, only adds to the confusion. However, upon closer examination you will see that, unlike a hummingbird, it has two thick, black antennae protruding from its head. Also, this critter doesn’t have a bill like a hummingbird. Instead it has a long, very thin proboscis that it uses to extract nectar from flowers. It is called a clearwing due to the fact that patches of its wings are devoid of any scales. 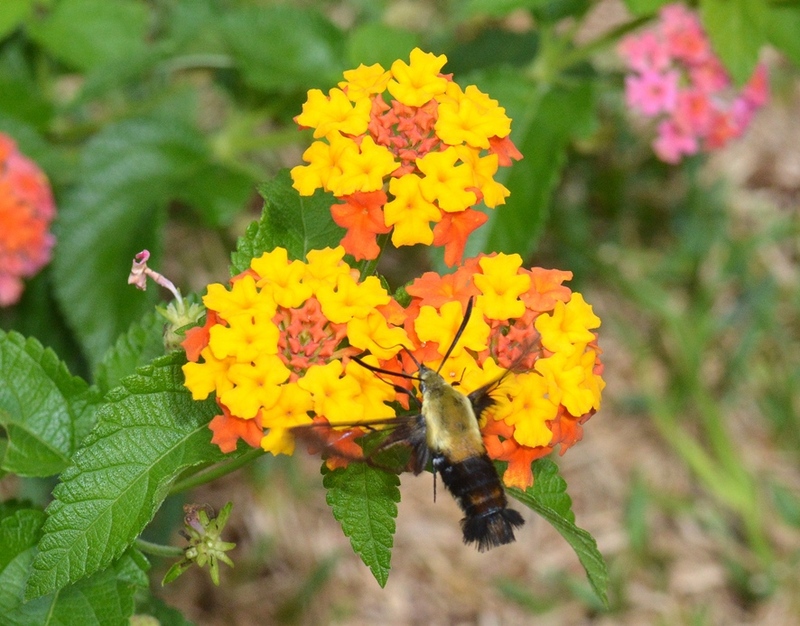 Please note that the lantana blooms can been seen through the right wing of the clearwing depicted here. The snowberry clearwing is different than other clearwings because it has a cream-colored thorax and a yellow band running around its abdomen. If you watch a snowberry clearwing for a few minutes, you will see that, like a chimney swift, it never stops flying as it feeds. The snowberry clearwing has two broods per year and can be seen flying about our yards from spring through summer. This moth is named the snowberry clearwing because one of its main host plants in snowberry. The snowberry clearwing will, however, also use dogbane and honeysuckle as caterpillar hosts.